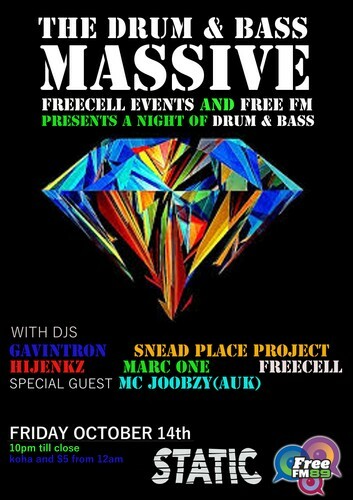 Freecell Events and Free FM presents "The Drum and Bass Massive launch party of Dj Freecells new radio show on Free FM. Also, there hasn't been any Drum and Bass in Hamilton for quite some time... It's a no brainer! I'm very humbled to have DJs Gavintron, Hijenkz, Marc-One and Static's resident DJ's Snead Place Project. Also joining the team will be special guest MC Joobzy (Auckland). With a line up like that, it will make for a most excellent night of DNB in the Tron!